About twelve inches long. Beautiful black all over with purple, blue and green iridescent tints. A staring black pupil is centered in a bright yellow iris. Uses its long tail to steer with in flight. The crackly wheezy blackbird voice sounds like a squeaky barn door hinge and a flock of grackles sound like a thousand wheel barrows. Abundant throughout North America east of a general line from New Mexico to northern British Columbia. Birds located in the northern range migrate. Uncanny thieves, they pillage song bird nests and your picnic lunch if left unattended. They gather in enormous flocks in the autumn before migrating south and ravage corn, sunflower and grain crops leaving more unharvestable on the ground than they consume. In the breeding season, small bunches are often seen in fields and on city lawns scratching for grubs worms, bugs and seeds comically walking their funky head bobbing walk. Were it not for some of their other deeds they might be considered beneficial. 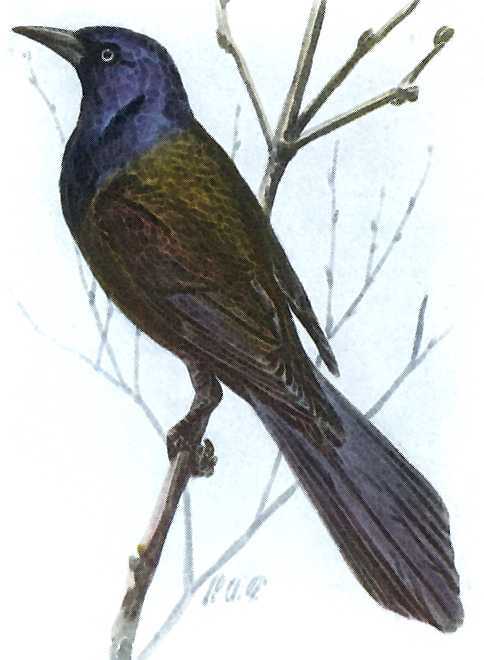 Builds nests of twigs, grass, hay, sometimes cemented with mud lined with fine grass between six and sixty feet high on branches preferably in coniferous trees, although not picky and sometimes in tree hollows and abandoned cavities, often near or over water. Sometimes they nest in numbers in the same tree for safety and sometimes even nest in a small opening in the lower parts of an Osprey’s nest of sticks. Females lay three to six light greenish white speckled eggs (however the color varies greatly), which hatch after about two weeks incubation and young are ready to leave the nest in about another three weeks. 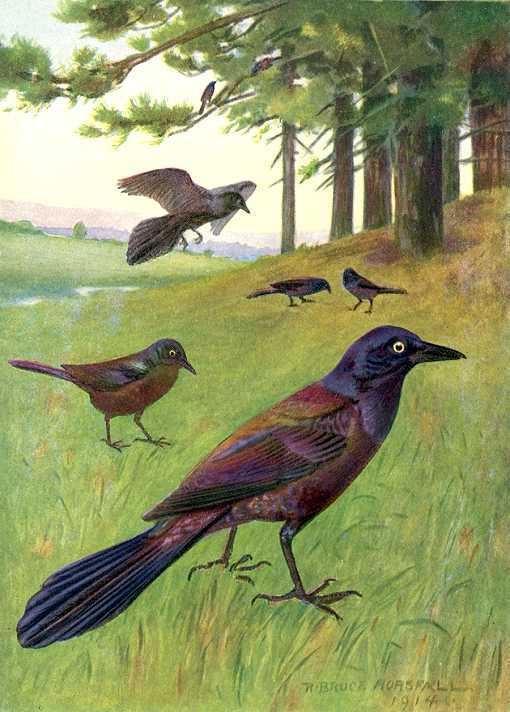 The best thing about a Grackle Birdhouse is that you will probably find something besides a grackle in it. It is the same nest box as for saw-whet owl, pygmy owl, Lewis’s woodpecker, and northern flicker. It has a 7″ by 7″ floor, 16″ inside ceiling, 2 1/2″ diameter entrance hole located 14″ above the floor and ventilation openings. Assemble with corrosion resistant screws fit to pre-drilled countersunk pilot holes to reduce wood splitting. Secure hinged roof with shutter hooks for easy access. Mount out of reach (10 feet or higher) near a woodland edge or clearing, tree stand, or park. Place some wood chips on the floor. Remove everything and clean the nest box well after the brood rearing season is past. You may also find kestrels, flycatchers and various owls and woodpeckers using this nest box. Uncanny thieves, they pillage song bird nests and your picnic lunch if left unattended. They gather in enormous flocks in the autumn before migrating south and ravage corn, sunflower and grain crops leaving more unharvestable on the ground than they consume.